You don't just want a job. You want a satisfying job - and you would like to make good money, too, right? Finding a great place to work with a decent paycheck to go along with it isn't the easiest thing to do in this economy, but it can be done. Once you find the job, you have to land it. That means you have to do a lot of things right, in succession, in order to make that dream come true. Most importantly, you have to make a great showing at the job interview... which you CAN do if you just do some preparation before you shake hands with the interviewer. Below, I will give you some valuable job interview tips for the coming year which you can use to gain more control of the interview situation and improve your ability to impress the prospective employer with your professional and personal skills. Your Resume - It needs to be pristine - and - bring a few extra copies with you to the interview. Make sure it is the same version you provided to the company initially. If your resume does not list the dates of your employment or other specific job-related information, have a separate sheet of paper handy with this information. If you are asked to complete a job application form, you'll have the extra information you need. Your Salary History - The interviewer may ask you for this. There are pros and cons to providing this information at the interview, so weigh this ahead of time. Your References - Again, this may or may not be requested, but it is always better to have it handy. You might want to consider having one sheet with professional references and another sheet with personal references. This isn't about the company's most recent stock price. This is about what they do and how well they do it. You need to spend some time understanding this even at a basic level. If the company makes a certain product, find out how long they've been at it, who they sell to and who their competitors are. Is there anything they plan to do differently in the year ahead? Are they in an emerging market? How is the company organized? Where is their headquarters located? Why are they hiring now? You are going to have to answer some serious questions, so you had better ask yourself before the interviewer does. This isn't just about practice and memorization, either. It is about understanding what matters to you - where is your career headed - what is going to make you happy. Be honest with your answers. Why DO you want to work for this company? What is your greatest strength? Getting the answers "right" isn't the "right" answer. Answering the questions in a way that creates a true picture of the real you is the best approach. One of the best ways to do this is to just DO IT. Practice interviewing with a friend or a family member you trust. The reason you have to trust them is because you are going to be sharing the real you, right? Role play the interview with your friend. You will release a lot of the nervousness and tension while you are doing this. When it comes time for the "real" interview, you will be so much more relaxed. You won't believe it. This pays major dividends. If you can't do that, record yourself and see how you look answering questions. What kind of image are you projecting? Polish your style as well as your answers and you'll improve with each recording. This tags onto #3 a bit, but it goes a step further. Now, not only are you focusing on yourself, but in a way that defines what you want personally and professionally. What kind of work do you want to do? What DO you want to be doing in 5 years? Are you going to be happy working for XYZ Company? How much money do you need to make to make ends meet? How much money do you need to be happy? Find out what matters most and use that as a measuring stick when making a decision about accepting a job offer. It will take a little time to get all of this in order but there are two things that doing this helps with: first, you will be more confident in the interview and second, you will do much better than other job candidates. Now, here is something you didn't expect, but I'll throw it in as a bonus: Interviewing is a highly subjective process. Interviewers will most likely hire someone who is like themselves. If you can find a common ground with your interviewer, gently embrace it. That little piece of advice is easily worth your next year's job salary. 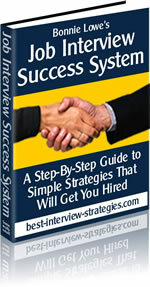 These Job Interview Tips for 2012 are sure to help you succeed. I truly wish you the best.